Of the Second Vatican Council’s 16 promulgated statements, a total of over 100,000 words, by far the shortest is the “Declaration on the Relation of the Church to Non-Christian Religions,” also known by the first words of the Latin text, Nostra Aetate. It has only 41 sentences in five paragraphs. The fourth paragraph, on the Jews, is the longest—17 sentences. 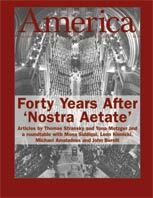 For most readers 40 years later, Nostra Aetate stands by itself. It is an end product stripped of any references to the unpredictable and threatened journey that began in mid-September 1960 and ended on the day of the declaration’s solemn proclamation, Oct. 28, 1965. Surprises, shocks and setbacks marked that journey. All the same, most setbacks became blessings in disguise. On June 5, 1960, Pope John XXIII had created the Secretariat for Promoting Christian Unity. The secretariat’s mandate was very vague: to help other Christians “follow the work of the council” during its preparations. That same month the pope designated Cardinal Augustin Bea, S.J., to be the secretariat’s president and Bishop Johannes Willebrands to be its secretary. By Sept. 3, the pope had appointed two full-time staff persons along with 15 bishop members and 20 consultors. Most of these appointees were already well known for their ecumenical experience and writings. I myself was a staff member. All of those named to the secretariat gathered in Rome for the first plenary meeting on Nov. 14-15 to flesh out the mandate. At that meeting the secretariat’s members and consultors were surprised to receive a second mandate, an interreligious one dealing with Catholic-Jewish relations. How did this second mandate come about? In mid-June, Pope John had had a conversation with Jules Isaac, an 81-year-old French Jew whose impressive credentials included government experience and scholarship in history and education. He was also a principal founder of Amitié Judeo-Chrétienne, a Paris-based study group of about 60 Jews and Christians. It is not difficult to summarize the “first tendency,” the anti-Jewish tradition, although one cannot say how many bishops, priests and laypeople still subscribed to it at that time. The tradition held more or less the following: God continues to punish the Jewish people for its rejection and killing of Jesus, the Son of God, Messiah and Savior of all. By this deicide Jews have forsaken all rights to God’s promise in the Old Covenant, which has been completely replaced by the New, identified as the Catholic Church (supercessionism). Like sinful Cain, Jews should continue to wander the earth as vagabonds without a homeland. God sustains their dispersed existence to remind Catholics of the divine blessings of the New Covenant and Jews of their true calling to share the same by converting. It was harder to elaborate, justify and promote the “second tendency,” the biblical, with arguments against the deicide charge and its consequences—in particular the theory of total supercessionism and the view that Jews had worth only as potential converts. The fostering of a spiritual, theological and catechetical turnabout became the secretariat’s task. Could this process of purification remain “purely religious”? Could it remain aloof from political realities—the Arab-Israeli conflict, for example? The secretariat’s initial “Why not?” was naïve. We did not grasp the fact that in the Middle East religious politics and political religion are the norm. We soon experienced a shock. When the Arab governments learned of the bare fact that the Secretariat for Promoting Christian Unity had a portfolio on “the Jewish question,” their diplomats rushed alarmist inquiries to the Vatican Secretariat of State. Except for Jordan and Saudi Arabia, all Arab states and the Holy See had mutual diplomatic relations. Israel had none. An umbrella thesis would function for the next six years: any favorable religious treatment of the Jews constitutes a political act. For the Arabs, this would mean a positive support of their enemy, the intrusive “Zionist entity.” For the Jews, it would mean the strengthening of the inextricable bond of the Jewish people with its new state in the ancient homeland. Taking up the De Judaeis mandate, Bea admitted his ignorance of the specific complexities of modern Jewry in its different, often competitive, religious and secular agencies and organizations. “Is the council good for us Jews? Who knows?” A few knowledgeable Jesuit colleagues suggested consulting the so-called “Jewish pope,” Nathum Goldmann, president of the World Jewish Congress and co-chairman of the World Conference of Jewish Organizations. Goldmann and the cardinal met in Bea’s private quarters three weeks before the secretariat’s first plenary session. The cardinal requested a memorandum of recommendations for the S.P.C.U. and the council— “a united Jewish front as comprehensive as possible.” Goldmann explained that whereas the W.C.J.O. constituents might be willing to make such a recommendation, many religious bodies of Orthodox Jews, whether modern or ultra-orthodox, would refuse to collaborate. Why should Jews suddenly trust a solemn council to make a 180-degree turnabout in Catholic negative teaching about the Jewish people? And if, prompted also by recommendations from Jews, the Catholic Church could and would change its belief, might it reciprocate with requests to Jews for changes in their belief by shedding their Jewish faith in their God-given uniqueness and identity as the people of the Covenant? In sum, Vatican II might be a subtle way of proselytizing. The Orthodox opted for distance from that “theological parley.” Other Jewish religious leaders, however, opposed isolation. In Rabbi Abraham Heschel’s phrase, “No religion is an island.” Take a risk. The W.C.J.O. memorandum arrived somewhat late— March 1962. Like other documents requested from Jewish sources, this one confirmed thedirection of De Judaeis and stressed Catholic-Jewish “cooperation in opposing all forms of racial prejudice and religious intolerance.” Goldmann’s pulse-reading proved accurate. The pro-and-con debate about “dialogue with Christians” became public, and during the council the arguments about the active, unofficial Jewish presence in Rome became even more public. Then came a blessing. With the pope’s nod to Cardinal Bea, the S.P.C.U. shifted its method. It proceeded to draft its own theological-pastoral schemata for the 110 members of the Coordinating Commission. This commission scheduled a presentation by the S.P.C.U. (on ecumenism, on religious freedom and on the Jews) for mid-June, that commission’s last meeting before the council was to convene. A second setback hit a week before that meeting. In Jerusalem the World Jewish Congress announced its appointment of Israel’s counselor on Christian affairs in the Ministry of Religion to be an observer at the council. Foreign Minister Golda Meir endorsed the appointment. Much to Nathum Goldmann’s anger, this real foul-up in fact, wording and endorsement prompted immediate, vigorous protests from Arab diplomats. The political silenced the religious. Bea supported the decision of Secretary of State Cardinal Amleto Cicogani: De Judaeis, without presentation or discussion, was withdrawn from the agenda. Toward the end of the council’s second session (1963), the three texts were distributed for the first time and reached the council floor, but only for “general comments.” The Fathers examined the prelude to their longer, detailed “Great Debate on the Jews” at the third session (1964), when they had in hand a revised text with a few changes that showed weakenings of the text that were obviously the result of compromises. The symbolic word deicide, for example, no longer appears, although the new text more strongly condemns the concept as unscriptural and, with the corrections, not to be taught. Cardinal John Heenan of Westminster, vice president of the S.P.C.U., bluntly charged that the softenings did not arise from S.P.C.U.’s members and consultors but from elsewhere—from “inexperienced experts, periti imperiti.” He named no source, but it was quickly leaked; the changes had come from the politically sensitive Secretariat of State. The third objection came from bishops of Asia and Africa. If the council deals with the spiritual bonds between the church and the Jewish people, they said, then enlarge the schema to embrace two-thirds of the world’s religious peoples who are not Christians or Jews. But a higher imperative was in the air during the third session: Reduce! Reduce the materials and integrate condensations into the major schemata. Sure enough, 10 days after “The Great Debate,” when the S.P.C.U. was just beginning to evaluate the spoken and written interventions, the four presidents and coordinating commission of the council strongly urged an alternative: insert a brieferstatementinto the proposed constitution “On Divine Revelation,” and insert the statement on other religions into the chapter on the people of God in the document on the church. This dispersal of contents into new settings would help avoid those political interpretations that bishops from the Middle East feared and Jews desired. It seemed a very reasonable and authoritative suggestion. It would have been no surprise if Nostra Aetate as such had joined a few other schemata in a quiet burial. The S.P.C.U. decided to consider this suggestion from above only after a new enlarged schema was prepared, even though the inclusion of other world religions seemed not within its competence and drafting skills. For this initial task, we enlisted non-S.P.C.U. experts. With their help, by mid-November the S.P.C.U. plenary group produced a remarkably polished declaration of five chapters. It began with an introduction to the objective unity of the human family, a unity of origin, pilgrimage and ultimate destiny that is reflected in universal questions seeking “answers to the profound riddles of the human condition.” This was followed by sections on various religions (primitive, Hinduism, Buddhism), on Islam and on Judaism. The schema concluded with a condemnation of every kind of discrimination and harassment because of race, color, condition of life or religion. This precise, clear and brief Nostra Aetate impressed the coordinating authorities and the pope. They saw no need to burden the fourth session with an open debate, so they scheduled only Cardinal Bea’s presentation and the voting on specific questions. This happened as planned on Oct. 14-15, 1965. The final surprise. The no votes on eight questions were far fewer than we expected. The four statements on the Jews received the most, but never more than 285 (objecting to the statement’s rejection of the word “deicide”). Two-thirds of the negative voters switched. Better a declaration with some defects than none at all. On the day of solemn proclamation (Oct. 28), only 88 of the 2,312 bishops registered dissent. In recalling my personal experience of Nostra Aetate’s six-year journey, I favor the biblical image once used by Cardinal Bea: the tiny mustard seed of Jules Isaac’s half-hour conversation with Good Pope John grew into the large tree that warmly hosts in its branches so many men and women of “non-Christian religions.” I remain convinced that this inclusive concept saved De Judaeis intact. To conclude: the all-embracing, positive character of Nostra Aetate as a whole marks its commanding import in Catholic history. For Nostra Aetate helped open the church to living dialogues with other communities of faith—respecting each one’s identity, ritual and conduct. This dialogue begins with “what human beings have in common and what promotes fellowship” (No. 1)—not merely human efforts, but God’s mysterious initiatives, through us, in a shared history. This article also appeared in print, under the headline "The Genesis of Nostra Aetate," in the October 24, 2005 issue. Thomas Stransky, C.S.P., was a founding staff member of the Vatican Secretariat for Christian Unity (1960-70), and rector of the Tantur Ecumenical Institute in Jerusalem (1987-99), where he still teaches.